The Melrose Passenger Transit Wheelchair transports wheelchair passengers from the check-in to the aircraft door. An assistant is required to push this wheelchair so it has a full width padded push bar for comfortable one or two hand pushing. 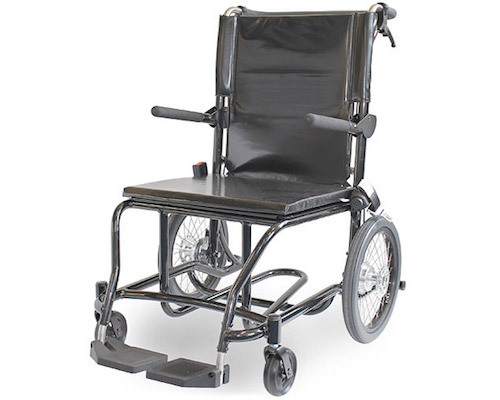 Large anti tip bars extend behind the rear wheels and can be used as a kick bar – by placing your foot down on the bar to help tilt the wheelchair’s front castors up over curbs. A cushion is provided for skin protection as well as comfort, the skin on a disabled passenger can be susceptible to pressure areas, abrasion and bruising, even after a short period of time on a hard surface. Armrests provide support for passengers with poor or no balance, they also allow the passenger to pressure relief if required. Our armrests rotate back out of the way to allow egress from the side. A Hip Seat-belt provides support and extra security for passengers with poor or no balance. It also prevents the pelvis from sliding forward and rotating the passengers’ natal cleft on to the seat base. The chair can be finished in a large range of durable heat resistant powder-coat colours and your airline or airport logos printed onto the seat back.